This year the Indiana Legislature changed the laws governing Artisan distilleries and we are now allowed to offer Distillery tours and tastings. We have updated our distillery to accommodate these changes. 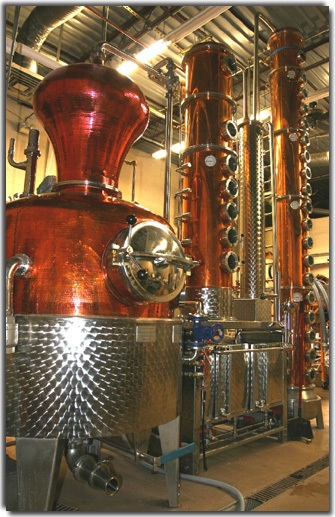 Virtuoso Distillers now has a bar were you can taste and purchase the spirits we produce. For those so inclined you can even purchase a 10 gallon barrel of new make whiskey, and enjoy it as it matures! Price: $8.00 per person, this will also include the tastes. We ask that you call us to book your tour at 574-277-0050 or 574 876 4450. While we will try to accommodate walk-ins, we can not always guarantee a spot on a tour. For those who might be interested in groups or using the distillery for your next small party or meeting we are available. While Indiana law prohibits us from selling bottles of spirits on Sundays, we can, by special appointment, set up tours of our facility on Sundays. The law also requires everyone who enters our distillery be 21 and we do verify ages. Copyright © 2009-2014 18 Vodka. All Rights Reserved.